Yesterday was a great day. Remember how he did almost three days' worth of work in one. We'll call it "working ahead." Today was not so good. It started out well -- he was in a very helpful sort of mood. My oldest had a school project that took over the dining room, and there were craft supplies everywhere. Jude helped me sort them all, pack them up, and put them away. Once we could see the dining room table again, we got to work. Sort of. Jude has some significant speech issues. To begin with, he didn't speak at all until he was nearly two. He has had significant developmental delays (at one point, he was globally over a year behind in development) as a side effect of other medical issues. With lots of work, he has become functional and nearly caught up in most areas, but speech continues to be a huge issue for him. What is frustrating is it's not language in general -- he has terrific cognitive speech skills. His expressive speech stinks, and "abysmal" is being generous. He used to use a lot of sign language, but has since transitioned to all verbal. He tends to drop sounds - often final sounds, but sometimes beginning and medial ones as well. He mispronounces letters. Often we have to guess at what he says. He used to be in private speech therapy, but was discharged because of his behavior (he would kick and bite the therapist). I'm hopeful we can do a new evaluation and try again sometime soon, but in the meantime, I'm trying to recall the two semesters of speech and dialect I had in college and combine that with what I can remember of that the Early Intervention therapist taught me. We started on some letters and speech this morning, and it didn't go so well. He was not really paying attention. It was taking two and three times of pointing to a letter before he'd just name any letter, not the one in front of him. I'll cut him some slack for ones he may not have known, but he does know "little e" and he missed it every time. A few minutes later, he started screaming. He had me worried -- they weren't tantrum screams, but deep, gutteral noises. 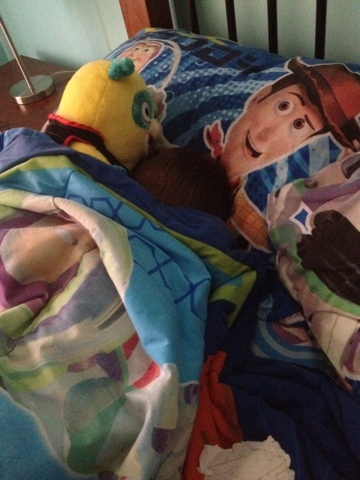 I peeked in his room to see if he was OK, and he was still in bed. He didn't see me, so I ducked back behind the door frame. He finally settled down and was quiet. A while later, I heard them again. This time I went in his room, and found sitting on his bed, with tears running down his face. He sobbed, "You came back!!" I came back? Dude, I never left. Then he said, "But the garage door opened and closed." Turns out the screaming was because he thought I left him home. Alone. My heart broke. Not only did he think I left him, but I didn't understand him when he was screaming. After lots of cuddles, we finally settled down. Dude, I'm right with you. some days, I just want to burrow into the blankets and hide, too. I'd probably have laid down and hidden right next to you, except you were hogging the entire blanket. After he woke up, we shelved the work and baked cookies. Tomorrow is a new day.